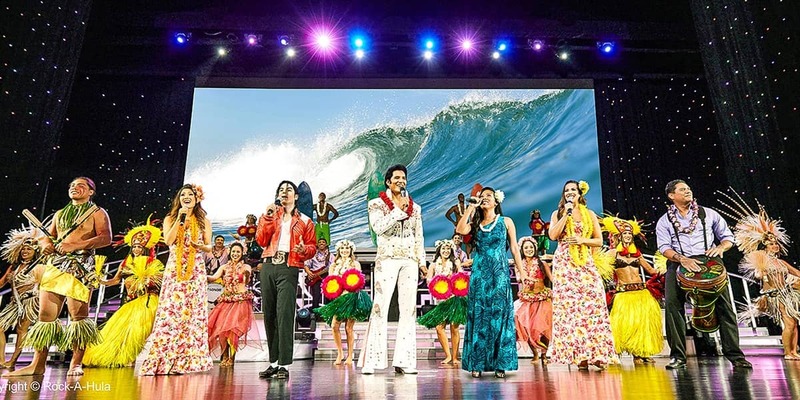 Rock-A-Hula is Waikiki’s newest and largest show featuring “Elvis” and an all-star cast of tribute artists at the 750-seat multimedia Royal Hawaiian Theater. A rockin’ live band, fabulous dancers and imagery of actual concerts complete this “must see” musical extravaganza for all ages. Our world-class Legends Artists portray Elvis Presley, Michael Jackson, Lady GaGa and others. Legends in Concert Waikiki’s “Rock-A-Hula” takes place on the 4th floor of the beautiful Royal Hawaiian Center, within walking distance of most hotels in the heart of Waikiki. 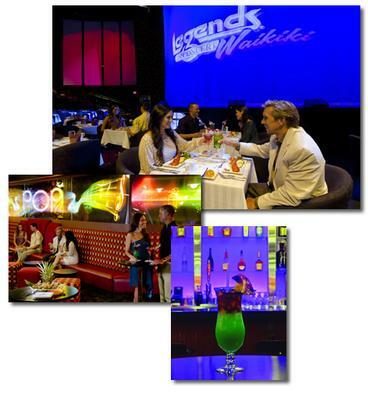 Unlike any other Waikiki live entertainment attraction, our presentation and experience is far more than just a show. One super premium beverage at the Treetop Terrace, or at one of our fabulous bars and lounges. Socialize, browse through the Legends Room® with authentic memorabilia, and get ready for the show! Meet-and-Greet An exciting opportunity to get autographs, take photos and chat with the Legends’ artists and dancers. Upscale Hawaiian buffet featuring over 20 tasty items at the open-air Treetop Terrace: Roast Beef Carving Station with gourmet Hawaiian sea salts, Hulihuli Chicken, Kalua Pork with Cabbage, Pacific White Fish with coconut curry sauce, Lomilomi Salmon, Hawaiian Greens Medley*, Long Rice Salad*, Tofu Poke*, Duo of Sweet Potatoes*, Dessert Station of Cakes, Sorbet, Ice Cream, Cookies and Candies and much more. Served with Taro roll*, sweet butter, coffee and tea. Special vegan selections are marked with *. Grilled vegan garden patty also available with 24 hours notice. One Welcome Blue Hawaii Mai Tai. Also enjoy cocktails at the Treetop Terrace® or at one of our fabulous bars and lounges. Socialize, browse through the Legends Room® with authentic memorabilia, and get ready for the show! First hour free with validation and $2.00 per hour thereafter for up to 3 hours total. Starting with the 4th hour and beyond the rate is $2.00 every 20 minutes ($6.00 per hour). Legends in Concert Waikiki’s “Rock-A-Hula” takes place on the 4th floor of the beautiful Royal Hawaiian Center, within walking distance of most hotels in the heart of Waikiki. 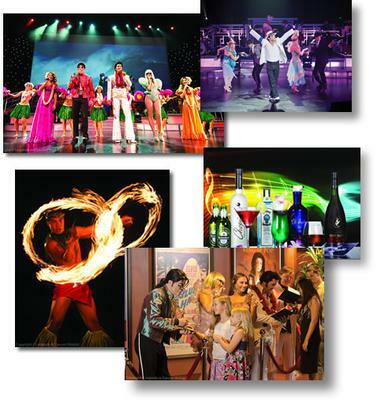 Unlike any other Waikiki live entertainment attraction, our presentation and experience is far more than just a show. 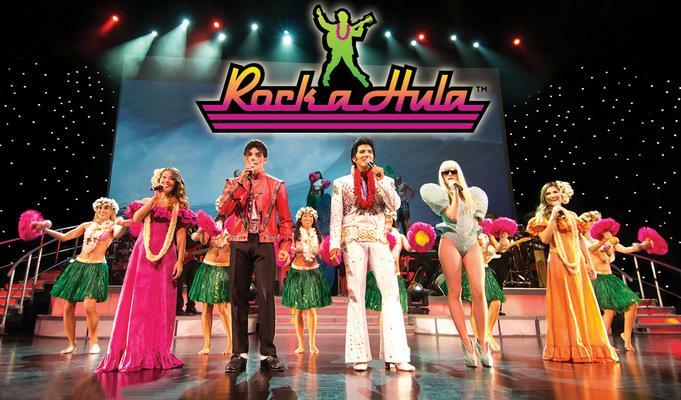 The setting for “Rock-A-Hula®” offers many fun options and time-permitting, allows guests to enjoy the evening their own way: The $20 million Royal Hawaiian Theater, featuring a dramatic 42-foot ceiling, and state-of-the-art lights, sound and multimedia technology, has a capacity of 750 theater seats. 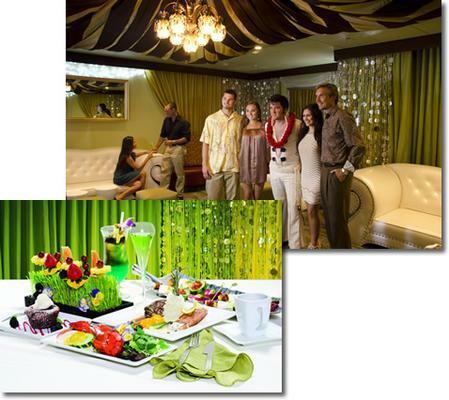 In addition, guests can enjoy the open-air terrace and stageside VIP areas for gourmet dining. Last but not least, the Legends Room allows viewing of authentic memorabilia on loan from the families and estates of the stars our show pays tribute to, and the exclusive Green Room (for Green Room guests only) to experience a taste of backstage excitement. Don’t forget to also explore the Royal Hawaiian Center with 310,000 square feet of over 100 brand name stores, unique Hawaiian goods, a wide variety of restaurants and lush tropical courtyards. Guests are seated at private, front row, stageside tables for their 4-course steak and seafood dinner, with Maine Lobster with Rainbow Salad of local baby greens, Heart of Palm, yellow beets, Kamuela tomatoes and cucumbers with passion fruit “champagne” dressing; Grilled Tenderloin Steak and Atlantic Salmon with sautéed fresh market vegetables and black truffle mashed potato; Lava Flow Dessert of warm molten chocolate cake with macadamia nut ice cream and raspberry sauce. Served with dinner roll, sweet butter, coffee, and tea. Special menus of chicken, fish or vegan available with 24-hour notice. A souvenir photo with a star is provided (per 2 persons). After the show, there’s a meet-and-greet session with the artists. Guests should arrive at 6:00 p.m. Guests are escorted to their stageside tables for the same dinner served to Green Room guests: Delicious 4-course steak and seafood dinner, Maine Lobster with Rainbow Salad of local baby greens, Heart of Palm, yellow beets, Kamuela tomatoes and cucumbers with passion fruit “champagne” dressing; Grilled Tenderloin Steak and Atlantic Salmon with sautéed fresh market vegetables and black truffle mashed potato; Lava Flow Dessert of warm molten chocolate cake with macadamia nut ice cream and raspberry sauce. Served with dinner roll, sweet butter, coffee, and tea. Special menus of chicken, fish or vegan available with 24 hours notice. A drink ticket for a second super premium beverage is included. After the show, there’s a meet-and-greet session with the artists. Guests should arrive at 6:15 p.m. Legends in Concert Waikiki’s “Rock-A-Hula” takes place on the 4th floor of the beautiful Royal Hawaiian Center, within walking distance of most hotels in the heart of Waikiki. Unlike any other Waikiki live entertainment attraction, our presentation and experience are far more than just a show. The setting for “Rock-A-Hula®” offers many fun options and time-permitting, allows guests to enjoy the evening their own way: The $20 million Royal Hawaiian Theater, featuring a dramatic 42-foot ceiling, and state-of-the-art lights, sound, and multimedia technology, has a capacity of 750 theater seats. Also, guests can enjoy the open-air terrace and stageside VIP areas for gourmet dining.